On Thursday morning, the Fishery Monitoring Branch of National Oceanic and Atmospheric Administration (NOAA) Fisheries’ Southeast Fisheries Science Center released shrimp landings data from the Gulf of Mexico for February 2019. Overall, NOAA reports that 4.5 million pounds of shrimp have been landed in the Gulf of Mexico through the first two months of this year. That figure represents the lowest total for this time period reported for the region in the historical dataset maintained by the Southern Shrimp Alliance going back to 2001. These low volumes may be the result of problems with data reporting in three of the five states in the Gulf of Mexico. No shrimp landings have been reported in Mississippi for the first two months of this year, while landings reported on the west coast of Florida are less than half the prior 18-year historic average and the lowest reported over the last nineteen years. 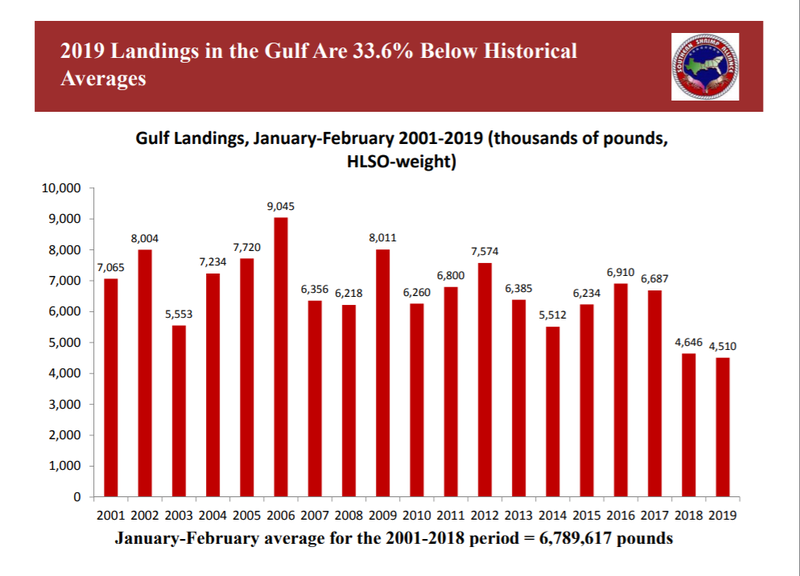 At the same time, landings in Louisiana over the first two months are reported to be nearly 70 percent below the prior 18-year historic average. This reporting is inconsistent with NOAA’s reporting for Alabama and Texas, where shrimp landing volumes this year have been in line with shrimp landings over the first two months in those states the previous four years. In February, 2.1 million pounds of shrimp were landed by commercial fishermen in the Gulf of Mexico. This was a significant decline from the 2.7 million pounds of shrimp harvested in February 2018 and 26 percent below the prior eighteen-year historical average for February of 2.8 million pounds. NOAA was able to report ex-vessel prices for three count sizes of shrimp landed in eastern Gulf (the west coast of Florida) in February (15/20; 21/25; and 26/30), with these prices below levels reported in February 2015, February 2016, and February 2017. For the northern (Alabama, Louisiana, and Mississippi) and western (Texas) Gulf, ex-vessel prices for large shrimp – U15 count were higher than they were in February 2018. However, for all other count sizes, ex-vessel prices were significantly lower last month than they were in February 2018.